Nestled among the trees behind one of the suites, rests a red rustic looking building called the Loft. It is a short walk down the sidewalk from the back of the house or a small climb up the driveway from the other side where you can pull in by car. When you step inside this simple building from the outside, you are greeted by high ceilings with large windows full of natural light and hardwood floors. Off to one side sits a small kitchenette containing a sink, toaster oven and full size refrigerator. If you look closer, you’ll be amazed by the stacks of creativity that surround every inch of this cozy warm space. Sewing machines for quilting, paint, paper in all colors of the rainbow, brightly colored markers, glue, ceramic pieces in all shape and sizes….it is truly an artist’s dream. By far the most amazing aspect of this artistic hide-a-way isn’t just the tools to create or the magnificent art that sits in different stages of completion, but the people that come weekly for their very own art therapy. Most often a small group of ladies, (men are always welcome as well) gather from the different Sojourn Suites or the Day Center every Friday for a morning to relax, create, and visit about anything new that’s transpired over the past week. Grown children, grandchildren, pets and the current news of the world are all topics touched on by these creative ladies. While Juanita works on her needlepoint, Geri sews pieces for a quilt. Patty and Judy sit together coloring in the newest craze – adult coloring books. 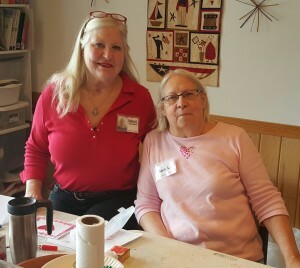 Donna bounces between making Valentine cards and her ceramic project with a cross country ski containing winter landscapes. Sue is present as well, gathering up different art supplies and arranging them on the large shelves that line the outer walls of the room. Coffee cups sit on the table as well as a deck of cards, which are also played often. From time to time, Donna even makes brownies for the group to enjoy, ad ding to the relaxing atmosphere of the morning. Although the ladies often work independently, there are also opportunities for group projects. 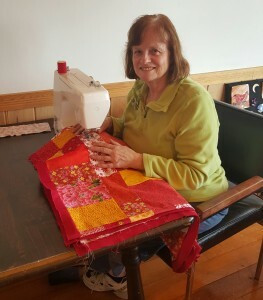 There are volunteers that come in to quilt and teach different projects throughout the year. “We are always looking for volunteers to come and teach a class, whether it be once or an ongoing project”, commented Sue. After speaking to this group, it’s easy to feel the comradery and happiness that fills the air. As Pablo Picasso once said, “The purpose of art is washing the dust of daily life off our souls.” We would have to agree.